This week I’m super happy to introduce two inspirational Goal Diggers who make up the team at Real Health NZ. Ren and Jen have created an amazing online platform to empower women’s wellness through real food and daily movement that is accessible to everybody! They have a clear passion for health, fitness and holistic wellness and from what I can see have worked bloody hard to create a one stop shop website with all the tools to establish a healthy lifestyle for women in Aotearoa. Keep reading to find out heaps more about Real Health NZ as well as Ren and Jen’s motivations, inspirations and tips for living a fulfilling and healthy life. 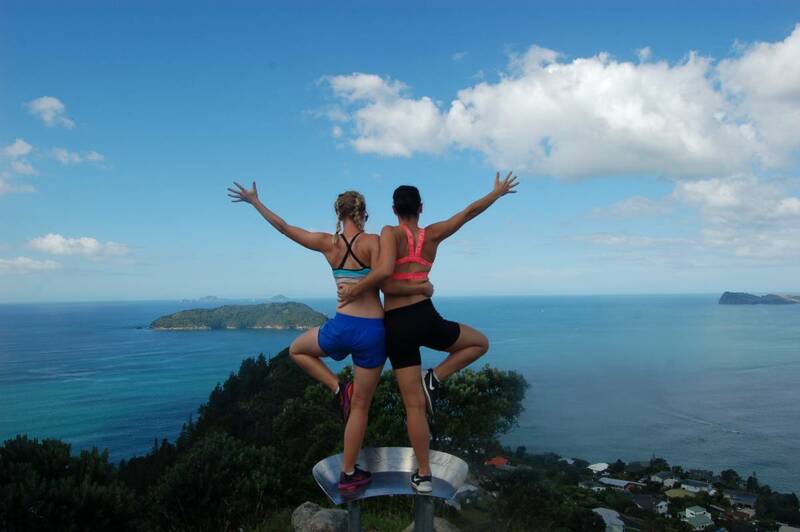 Together we are two everyday kiwi chicks on a mission to inspire and empower everyday women to adopt and sustain active healthy lifestyles through our women’s wellness website Real Health NZ! Our aim is to provide women with the tools to establish a healthy lifestyle filled with daily movement and real food through our Online Exercise Room and Online Real Food Kitchen! Launched our Womens Wellness website Real Health NZ! (Something we talked about for months before finally deciding we should just take a massive plunge and do it!) We are really proud of what we have created, we love what we do and even more so, we love that we are helping women get active and live healthy lifestyles. It’s an awesome feeling! On October the 2nd we officially launched our website! We celebrated with our close friends and family over a glass of bubbles and shared some of the many stories we have had along the way! Following this we spent some quality time away with our husbands as we had been seeing more of each other than them!! Having full time jobs whilst building Real Health NZ was and still is a challenge for both of us! We have made lots of sacrifices, had many late nights and long weekends but being so passionate about our message has kept us going! Another massive challenge has been learning everything from filming and editing videos, creating a website and coming up with funky designs – you name it we have you tubed it! Putting ourselves out there as our true authentic selves for the world to see and judge has been really scary! There ain’t no airbrushing going on at Real Health NZ, we are all about bare faces and messy hair! We really have stepped out of our comfort zone, tried to create something unique and real in the hope that we will be able to relate to everyday kiwi women. Inspire more women to invest in their health and to realise that living a healthy lifestyle doesn’t mean counting calories and spending hours in a gym! Working hard to establish our brand and spread our mission far and wide! The health and fitness industry has made things so confusing and we have seen so many women and young girls (Jen as a teacher) confused with how to look after their bodies. We found ourselves increasingly frustrated with the amount of quick fixes on offer, unrealistic and expensive exercise programmes out there. We wanted to make a difference and create something that would encourage everyday women to move more, eat real, treat their bodies exceptionally well yet in a realistic and sustainable way. We totally believe that making healthy food choices and exercising doesn’t need to be complex, fancy and cost the earth! To get more women moving, realising their potential and not taking their health for granted. This doesn’t feel like work! We love creating content for our members and are so passionate about creating a platform that changes lives. We are consistently bouncing off each other and coming up with new ideas to make Real Health NZ bigger and better! See more of the beautiful country that we live in! Milford Sound and Queenstown (how have I not been there!?) are top of that list! Travel! So many epic places I still need to see! Greys Anatomy! So much drama! We practice what we preach! Move More. Eat Real. Everyday. No exceptions.